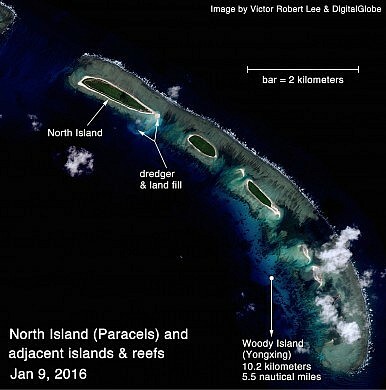 Victor Robert Lee, “Satellite Images: China Manufactures Land at New Sites in the Paracel Islands,” The Diplomat, 13 February 2016. Posted with author’s explicit permission. 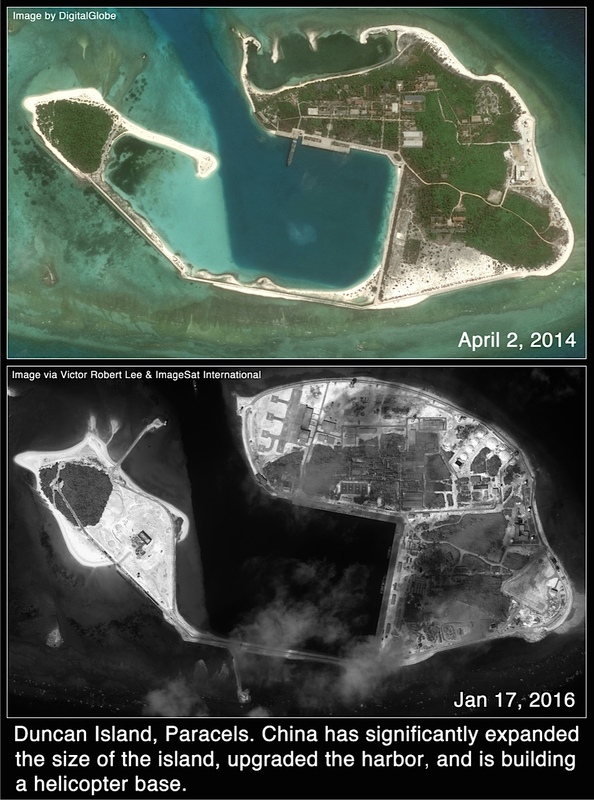 Satellite images show dredging and land filling by China at two new sites in the South China Sea, both in the Amphitrite group of the Paracel Islands, approximately 15 kilometers north-northwest of China’s military base at Woody (Yongxing) Island. 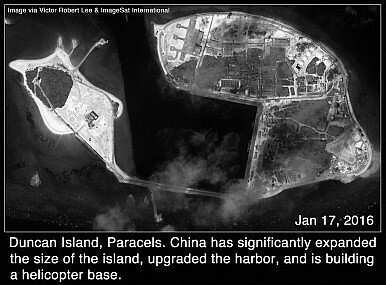 Also newly visible is a helicopter base under construction at Duncan Island, another site in the Paracels, suggesting that Beijing may develop a network of bases in the South China Sea to support anti-submarine warfare helicopters, such as its recently deployed ASW Z-18F. 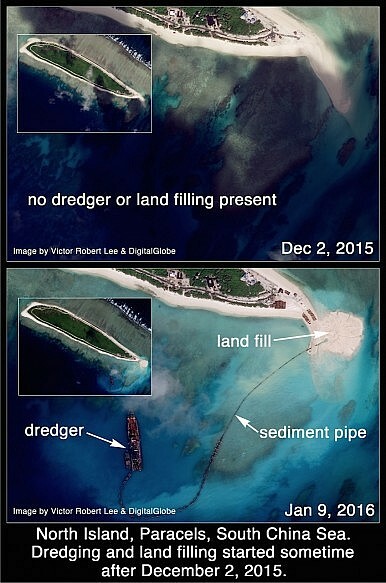 The most recent dredging, which began sometime after December 2, 2015, is creating new terrain on the reef adjacent to North Island, held by the PRC since 1950. 5.5 kilometers northwest of North Island, at China-occupied Tree Island, a cutter suction dredger can be seen expanding a port area and piping sediment onto a new area of land fill. A series of satellite images indicates that the dredging at Tree Island began sometime after October 18, 2015. 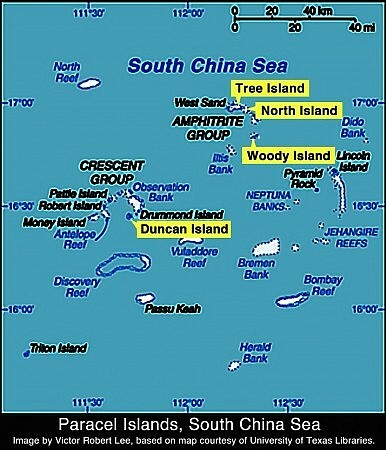 North Island and Tree Island are both part of wide and shallow reef complexes extending for more than eight kilometers each, and they offer much larger surface areas for exploitation than those available at Woody Island, China’s main installation in the Paracels and the location of China’s first airport in the South China Sea (called the East Sea by Vietnam and the West Philippine Sea by the Philippines). 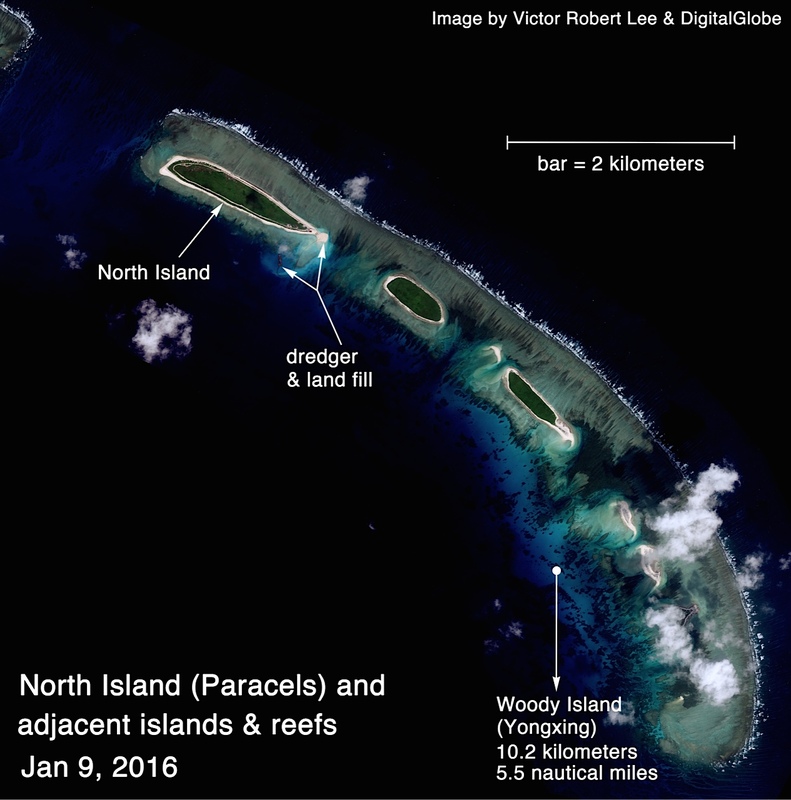 Woody Island, which hosts two harbors, numerous radomes, and many new buildings adjacent to an airfield that was significantly expanded in 2014-2015, is crowded and small compared to the installations, including runways, being built by China at Subi and Mischief reefs in the Spratlys, where continuous stretches of curved and straight reef 10 and 14 kilometers long, respectively, have been buried under sand. 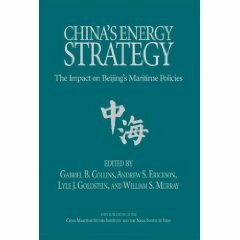 And China’s new base under construction at Fiery Cross Reef, though only roughly the size of Woody (three square kilometers), already appears to be more sophisticated; extensive structures, likely to serve as water capture reservoirs and fuel bunkers, have been dug into the coral substrate at Fiery Cross and covered with a protective layer of sand, as seen in imagery from January 8, 2016. The Paracels, all of which are claimed by Vietnam, Taiwan, and China, were partially occupied by Vietnam until 1974, when China took control of the Crescent Group in a battle with Vietnamese forces. 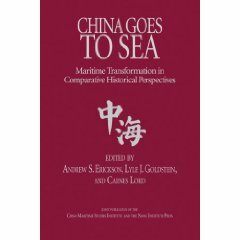 China has since controlled all of the Paracels, although the archipelago continues to be disputed. 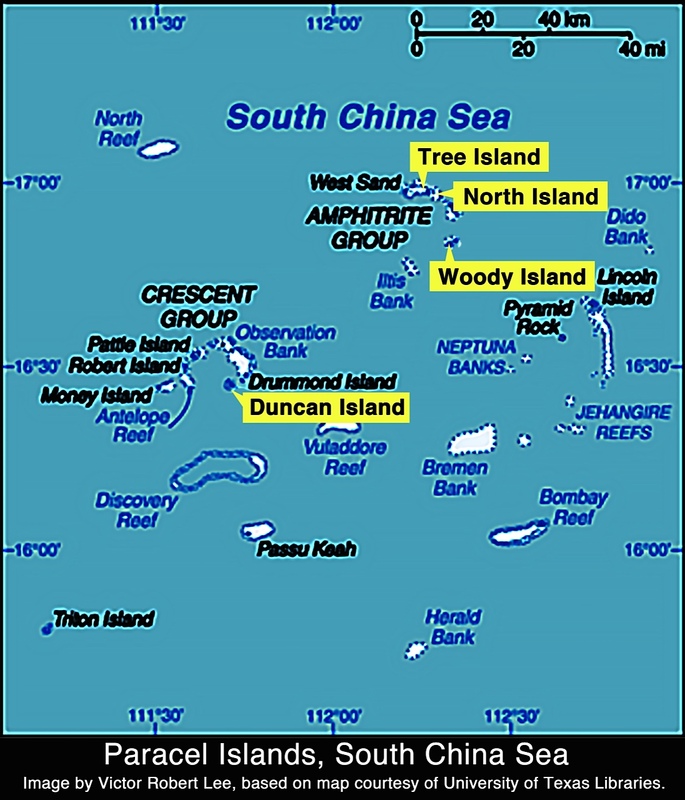 Recently in the news due to the passage of the destroyer USS Curtis Wilbur near Triton Island, at the southwest extremity of the Paracels, this quadrant of the South China Sea is also where China briefly positioned its oil rig Haiyang Shiyou 981 in 2014, resulting in vigorous protests from Vietnam that its sovereignty had been infringed. In addition to the ongoing expansion of its facilities at Woody Island, China pulled sand from the sea bottom to increase by 50 percent the area of Duncan Island in the Crescent Island group of the Paracels, expanding a protected harbor there and currently building a helicopter base on the island, with eight designated landing zones in place and four others likely to be completed soon. New helicopter base under construction at Duncan Island. This new helicopter base, apparently reported here for the first time, could signal a step-up in China’s ASW capabilities across the South China Sea. 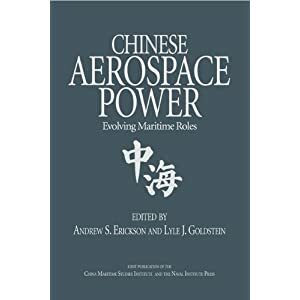 A network of helicopter bases and refueling stops scattered across the South China Sea, using no more than the bases China is already known to be building, would make almost any coordinate in the sea reachable by a helicopter like the Z-18F within two hours. 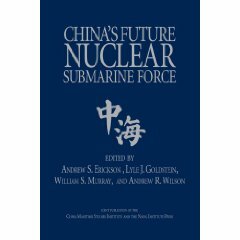 (The Z-18 parent of the Z-18F is reported to have a ferry range of 1,600 km, combat radius of more than 500 km, and maximum speed of 336 km/hour.) By hopscotching between bases, the helicopter fleet would be unconstrained by fuel range or limited numbers of ship-borne landing berths, creating a continuous and contiguous web of surveillance and response capability. Such a web would have utility beyond anti-submarine warfare, and would probably reshape surface ship and aerial combat strategies in the region. 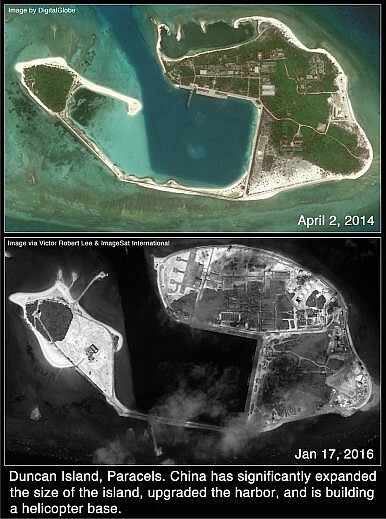 The recent developments at Tree, North, and Duncan islands indicate that Beijing is augmenting its position in the Paracels, which have been overshadowed of late by China’s epic construction projects in the Spratlys. 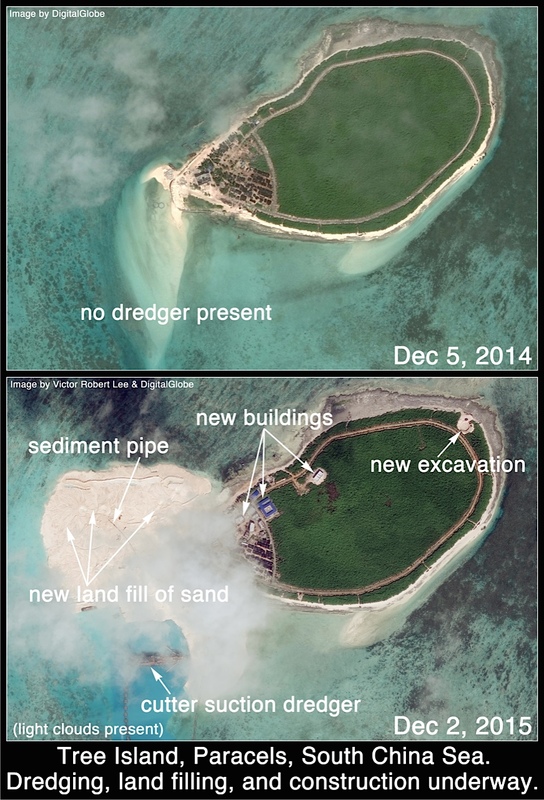 The images presented here, of new dredging and land fill at North and Tree Islands in the Paracels, may appear to show insignificant small spots of beige sand surrounded by a vast expanse of blue sea, but this is precisely how China started its swift conversion of Subi, Mischief and Fiery Cross reefs into large, artificial islands housing multi-purpose bases with far-reaching strategic implications. Victor Robert Lee reports on the Asia-Pacific region and is the author of the espionage novel Performance Anomalies.